Introducing two new gummy supplements to help you vitamin better! 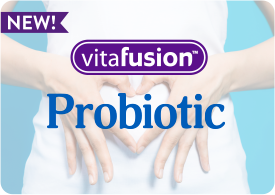 New vitafusion™ Probiotic supplement –fuses probiotics that provide friendly bacteria to the digestive tract with the deliciousness of a gummy*. 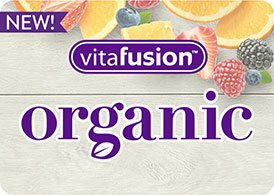 New vitafusion™ Turmeric Curcumin – contains 500 mg curcuminoids per serving, which provide powerful antioxidant properties*. All with a taste you’ll love! Try one today.